Have we finally gone Christmas pudding mad! 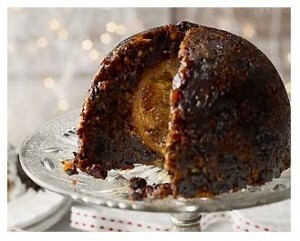 The ‘Christmas Pudding’ or ‘Plum Pudding’ has long been an old favourite, steeped in tradition and history. The pudding as we know it today comes from the Victorians but it surprisingly emerged as far back as the 1420s, not as a desert but as an early form of preserving meat! The meat was kept in a pastry case along with dried fruits acting as a preservative. The resulting ‘Mince Pies’ could then be used to feed many people, particularly useful in the festive season. 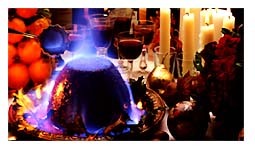 The Pudding can also be traced further back to Roman times, when it started life as a ‘pottage’ prepared in a large cauldron, the ingredients being slow cooked with dried fruits, sugar and spices. By the reign of Elizabeth I, prunes were added to the pudding recipe, this new addition was so popular the dish became known as ‘Plum Pottage’. By the eighteenth century, as techniques for meat preserving improved, the savoury element of both the mince pie and the plum pottage diminished as the sweet content increased. The mince pie kept its name, though the pottage was increasingly referred to as plum pudding. Although the latter was always a celebratory dish it was originally eaten at the Harvest Festival, not Christmas. It was not until the 1830s that the flour, fruits, suet, sugar and spices, all topped with holly, made a definite appearance, and the Christmas pudding was born. Traditionally puddings were made 5 weeks before Christmas, known then as ‘Stir-up Sunday’, traditions stated that everyone in the house, especially children, would give the mixture a stir, and make a wish for future prosperity and happiness. It became common practice for the Pudding to have a silver coin in it usually a thrupence or sixpence, to be kept by the lucky person who had it in their portion! This would hopefully symbolise wealth in the New Year! As our ever growing society strives harder, faster, further for those special things in life that we all must have, our humble Christmas pudding has not been spared. A special edition Christmas pudding created by celebrity chef Heston Blumenthal for the super market chain Waitrose has almost sold out in stores up and down the country and is now appearing on eBay for up to £250. The Hidden Orange pudding has a whole candied Valencia orange inside and went on sale for £13.99 in Waitrose less than 2 weeks ago. Tens of thousands have quite literally flown off the shelves and last night Waitrose said there were only 2,000 left in the country. The store said it was trying to produce more, but it is understood that the oranges take seven weeks to cure, meaning there are unlikely to be any new puddings ready in time for Christmas, which is why this pudding has become the most sort after food item of 2010. There are currently 151 Hidden Orange puddings on eBay. 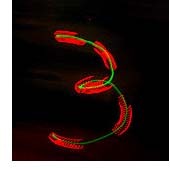 Some are ‘Buy it now’ offers at £250 and £99, and others are attracting bids of up to £102 or more. We really have gone mad but I prefer to leave it to chance, so if you missed out on Heston Blumenthal’s Christmas pudding this year maybe you should make your own and stir in a wish for one next year, I know I will!